If We Can Replace Antibiotics with Homeopathy, then Cheese is the New Miracle Cure! In the Guardian this week, HRH Prince Charles proposed homeopathy as a solution to antibiotic resistance, citing his “agro-ecological” farm as an example of one that has cut antibiotic use by using homeopathic treatments. Given the concern over bacterial resistance to medically-important antibiotics, it is vital that we find alternatives. Yet they also must have a biologically sound mode of action and be proven to be effective. It is difficult to conceive how a solution so dilute that not one molecule of active ingredient remains, where the premise of the mode of action depends on water having a “memory” of the ingredient (as opposed to all the other contaminants within that water), can possibly have any verifiable impact on disease. Indeed, there are no studies to date that show positive, replicable effects of homeopathy compared to conventional treatment. Personally, I have no issue with any alternative therapy has been shown to be an effective alternative to conventional drugs (note that homeopathy does not fall into this category). When I underwent chemotherapy for breast cancer, I had some reiki sessions. Did I believe that energy was being channeled by the reiki healer and making me better? Honestly, no. Would I have ever considered giving up the chemotherapy? Absolutely not. But the focused breathing and relaxation certainly helped with pre-chemo anxiety. Would taking Rescue Remedy or a similar homeopathic preparation have helped? If I’d believed that it would – yes, probably. But that is biased by the placebo effect – it’s not the same as the treatment being independently effective. One of the claims made for using homeopathic treatments in animals is that they are independent of the placebo effect – they don’t have the expectation that the tincture administered is going to cure their lameness or mastitis. Yet when we assess the results, it’s not the animal who’s reporting the success or failure of the homeopathic treatment, it’s the farmer. So let’s examine a scenario. A farmer has two mildly sick cows (e.g. slightly lame, or unwilling to eat with a raised temperature) within the herd. Both are moved to the hospital pen, given fresh bedding, water and feed plus a homeopathic remedy. Cow A gets better – hoorah for homeopathy! Cow B doesn’t and has to be treated with antibiotics – boo! Does this mean homeopathy works in 50% of cases? No. There’s no control treatment here, no evidence that Cow A wouldn’t have got better without homeopathy – some diseases just need time, TLC and the cow’s own immune system for recovery. Did the farmer cut antibiotic use? Yes – Cow A didn’t receive it. Yet again there is no evidence that this is due to the homeopathic treatment. How many times have we as humans debated whether to go to the doctor because of a minor ailment, then have found that it’s cleared up without medical treatment? It’s not miraculous, it’s simply our immune systems functioning as they are intended to. This week, another paper has been released claiming that we should change to a vegetarian diet in order to “…cut global food emissions by two thirds and save millions of lives“. As ever, media coverage of the paper by Springmann et al. ignored salient points regarding the importance of increasing fruit and vegetable consumption and reducing energy intake in reducing deaths from heart disease, cancer and diabetes; and simply focused on the claim that reducing meat intake would improve health and cut greenhouse gas emissions (GHGs). The simple message to the consumer? Go vegetarian. So are GHGs the only important environmental metric? Absolutely not. What about land use? Air quality? Fossil fuel consumption? Water use? Biodiversity? The myopic focus on GHGs as the only arbiter of environmental sustainability completely ignores these factors, yet the results of the current study (and similar papers) are promoted worldwide as a panacea to solve all environmental issues. Can you imagine a world where we only look at one consequence of our actions? Where our only consideration when buying a car is the colour of its paint? Or the criteria for accepting a new job is whether they have good coffee in the canteen? Surely a ridiculous idea – all of our actions have direct and indirect consequences, some predictable, some entirely unforeseen, and we weigh up these outcomes with every decision that we make – including dietary choice. If we examine a number of the assumptions and recommendations within the current paper, it’s apparent that the negative consequences of the one-dimensional GHG focus may outweigh any benefits gained. Although a regional approach was used to assess population health impacts, greenhouse gas emissions in the paper were based on reference values for various foods, with the inherent presupposition that all livestock production systems are equally productive and efficient. This is a fatally-flawed assumption. If we take beef as the example: in the USA, 90% of cows have a calf every year, cows first calve at 24 months of age and growing cattle are slaughtered at 15 months of age. By contrast, in Brazil, 60% of cows have a calf every year, cows first calve at 36 months of age and growing cattle are slaughtered at 42 months of age. Both systems are suited to the resources and market available, but have wildly different efficiencies. Consumption of a US-produced steak (16.7 kg CO2/kg) will therefore have a far lesser contribution to the average person’s carbon footprint than a Brazilian steak (62.0 kg CO2/kg). Replacing milk, meat and eggs with plant-based foods (legumes, nuts, etc) is entirely possible, yet it does not occur at zero environmental cost. Every single food that we consume has an environmental impact, and although the greenhouse gas emissions associated with a unit of lettuce or beans may be less than pork or beef (asparagus is a notable exception), the land required to produce equivalent energy or protein from plants is significant. We cannot simply remove cattle from the low-quality range and pastureland that they occupy in the majority of grazing regions and assume that we can plant brussels sprouts or soybeans instead. Only a small percentage of pastureland is productive enough to produce human food or fibre crops (8.0% in the USA and 10.8% in the UK). The fact that pastureland would have to be converted to cropland, releasing sequestered carbon dioxide to the atmosphere and increasing the use of fertilisers and irrigation water, was not accounted for in Springmann et al.’s study. Indeed, from where would we source fertilisers for crop production if we significantly cut meat consumption and thus livestock populations? Is an increased reliance on dwindling reserves of inorganic N, P and K really a sustainable solution? Finally, and most importantly, cattle do not simply exist as a source of milk or meat. In many developing countries, immense cultural significance is placed upon livestock ownership and ruminant animals play a vital role in supplying draught power, capital assets and agricultural enterprise diversification. Should a single mitigating factor for reducing GHG emissions overcome the moral obligation to support and assist subsistence farmers in developing regions? It’s vital that we take a holistic view that encompasses environmental responsibility, economic viability and social acceptability in order to improve food system sustainability rather than simply focusing on one aspect of the problem. Rather than taking a whole-system approach to environmental and human health, the study by Springmann et al. is akin to amputating both legs in order to try and cure arthritis. Short-term pain may be reduced, but long-term suffering is inevitable. Cutting Meat? Or Just Cutting Corners? It is equally interesting, inevitable and lamentable to see that another study has come out claiming that the only way to reduce climate change is to cut meat consumption per person. Meat consumption appears to be the only human activity subject to continuous “we must cease/reduce this” claims on the basis of environmental impacts. If we compare to other greenhouse gas sources, a considerable proportion come from transportation. Yet rather than insisting that every car-owner cut their annual mileage by 25%, the focus has been on reducing emissions by producing more fuel-efficient vehicles. Similarly, no one has yet claimed that we should reduce household lighting by four hours per day, but the compact fluorescent lightbulb (CFL) has become the poster child for improving household energy efficiency. We have demonstrable proof that beef and dairy producers have improved greenhouse gas emissions (as well as land use, water use, energy efficiency, etc) over time through improved efficiency, and can continue to do so into the future. So why are the gains made by livestock producers dismissed, and reduced meat intakes seen as the only solution? I have an absolute hatred of conspiracy theories, but it is difficult not to see an latent agenda in the preponderance of “Cut meat consumption” papers. Jumping on the bandwagon? Promoting individual dietary opinions as science? Or simply bowing to NGO/media opinions and looking for easy funding and publicity? As the global population increases to over 9.5 billion people by 2050, with the majority of this growth occurring in the developing world, the demand for milk, meat and eggs is going to increase by 60%. If we are serious about cutting greenhouse gas emissions, it’s time to examine the impacts of all of our actions and concentrate on further efficiency improvements rather than constraining dietary choice. Does Nature Really “Do Its Thing” on Organic Farms? I am lucky. 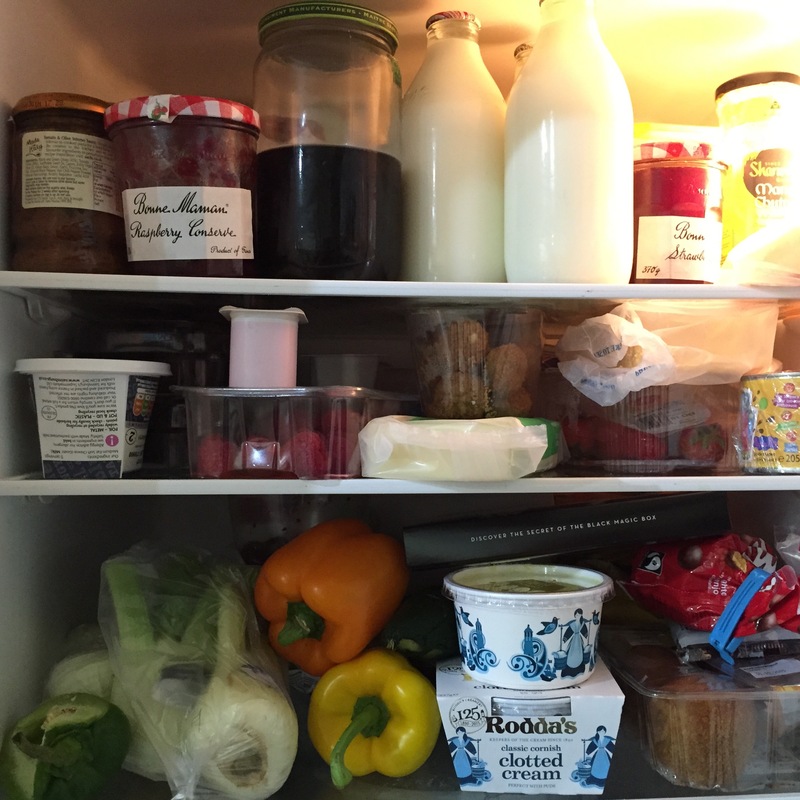 My fridge is full of food: mostly produced in the UK or Europe; all nutritious, safe and affordable; and almost all produced on conventional farms, with a small amount of organic food (in my case, chocolate). Given that you’re reading this, I’ll hazard a guess that you are lucky too. 795 million other people can’t say the same thing – and feeding all the people on a planet where 1 in 9 don’t currently have enough food is, in my view, our biggest challenge. If we ignore the nonsensical claim that natural ingredients produce positive results (Really? Let’s examine puffer fish, solanaceae poisoning, dangerous fungi, absinthe, the many consequences of obesity…), let’s simply look at his claim that organic food is natural. Except, well, it’s not. Agriculture first developed ~12,000 years ago, and ever since then farmers have been doing their best to breed crops and animals that are best suited to their farming system, whether it’s organic or conventional. Want dairy cows that produce high-quality milk from grazing pasture; leaner pork chops; or strawberries that can survive supermarket handling? You’ve got it. All achieved through traditional breeding techniques (otherwise known as “nature doing its thing”): noting that plant or animal A has desirable characteristics and breeding it with plant or animal B to (hopefully) produce better offspring. No scary chemicals, scientists with syringes or genes in test-tubes. Every farm in the world is founded on “nature doing its thing” – not just the organic farms. We can argue whether GMO crops are natural (breeding techniques are simply more refined and specific) or not (scientists playing god…) but that argument becomes redundant in the EU and many other regions, where GMO crops are not approved. Can organic producers use pesticides? Yes, if they’re compounds approved for organic production (e.g. highly-toxic copper-based fungicides). Can they use antibiotics and wormers? Again yes, if a proven disease problem exists (note that rules differ slightly between the UK and USA). Are organic farmers just merrily sitting back and letting their crops cross-pollinate and reseed, and their bulls run around happily “doing their thing” to whichever cow they come across? No. It’s a beautiful bucolic image to suggest that organic farmers are happily working with Mother Nature whereas conventional farmers have an evil scientist sitting on one shoulder and a big agribusiness corporation on the other, but its simply not true. According to Mr Oliver, “…the simple fact is that often we don’t actually have to interfere with nature.” The idea of a world where we could feed over 7 billion people without having to actually invest any research dollars into improving food production is lovely, but it’s smoke and mirrors. At the most basic level, what happens if we don’t “interfere” by controlling weeds (whether by chemicals, mechanical tillage or human labour)? Crop yields are reduced, food production goes down and we feed and clothe fewer people. What happens if a cow has problems giving birth? In nature, she dies. On a farm (whether organic or conventional) both she and the calf are saved, providing milk and meat for us to eat. According to the World Organisation for Animal Health, 20% of global animal protein losses are due to diseases for which treatments already exist – we simply need to make them available to every farmer worldwide. Just think how many more people we could feed if we interfered with nature in that way? Huge amounts of research monies are invested each year to find ways to improve food production on both organic and conventional farms worldwide. Some are highly technical, others are simple, but all are contributing to the goal of feeding the world. Unfortunately, when food pundits jump on the “let’s promote system X” bandwagon as Mr Oliver has done with organic production, using persuasive but false arguments, we lose traction in fulfilling the real goal. Rather than arguing about which foods we can/should be buying, we need to accept that there’s a place for all systems; examine the ways in which all systems can improve soil fertility, animal health and environmental impacts; and make faster progress towards feeding the world while still enjoying our food choices. Got Ebola? Just Take Some Vitamin C.
It appears that the lunatics are taking over the asylum. This is another post about “things that irritate me” – just a short rant this time about bad science and fear-mongering. The current irritant is the Alliance for Natural Health (ANH; as publicized by the Organic Consumers Association), which claims that Ebola can be prevented and treated naturally, but that these remedies are being (gasp!) “ignored by doctors and the government”. If you’re really concerned that you may catch Ebola, the easiest way to avoid it is not to have intimate contact with an infected person’s bodily fluids; but never fear, if you do, the ANH have a list of “proven” natural remedies that will stop Ebola dead in its tracks. For example, Ebola is selenium-dependant, making people who’re already selenium-deficient more vulnerable to the disease, so if you just load up with mega-doses of selenium, you’ll be fine. Equally, both silver and vitamin C are antiviral, so add these to your selenium cocktail and you won’t just be fine, you’ll be invincible! There’s just one problem – none of these miracle remedies have actually been tested against Ebola, which ANH claim is because of government/big drug conspiracies. It’s true that increasing your intake of selenium and vitamins C, D and E should boost your immune system to a degree, but you can’t then have a long smooch with somebody who’s infected with Ebola and expect to be immune. More importantly, given the ANH’s claims of natural “treatment”, there is zero evidence that any of these purported remedies provide a cure. Most worrying of all is the final tagline: “Alert! Write to both FDA and Congress. 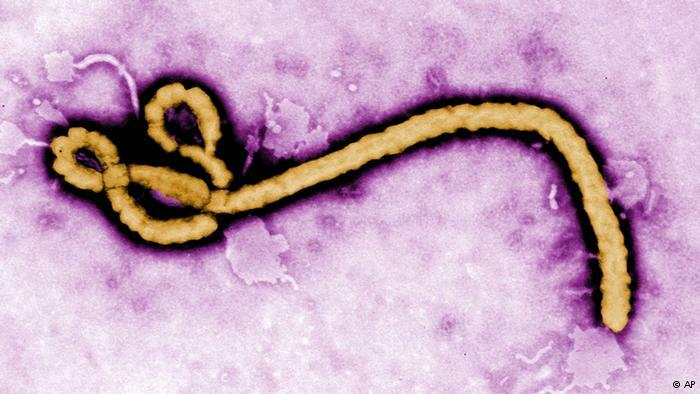 Ask them to review natural treatments for Ebola without the lengthy drug approval process“. This lengthy drug approval process exists to ensure that drugs are safe, efficacious and do not cause unexpected or severe side-effects. It costs drug companies millions of dollars to get a single drug to market through this process, which is required for every new drug in order to protect our health. Furthermore, “natural” chemicals are not safe or effective simply because they exist in nature. Arsenic, cyanide and mercury are all inherently natural, as are deadly nightshade and death cap mushrooms. The “action alert” above is an example of bad science and fear-mongering at its worst – a dangerous remedy that will do nothing to halt the spread of the disease – and will probably hasten the patient’s death in the process. One In Five Children Who Contract Diphtheria Die – Are Anti-Vaccination Activists Dangerous, Or Simply Misinformed? I had the pleasure of speaking in the plenary session at the 2014 AAVLD/USAHA Annual Meeting this week, where, among other topics, we discussed risk. One of the other panelists made the best point that I’ve heard in a long time – activists hate denominators. Think about the last few scare stories you’ve seen – there’s no doubt that it is frightening to read that 3,000 people die from food poisoning each year, or that, to date, 4,546 people have died from Ebola (one in the USA). Yet if we put this into context, one person out of 315 million in the USA dying from Ebola is a tiny tiny fraction, and a correspondingly tiny risk. Activists hate denominators because they provide us with context, a way to assess whether we’re really in danger. Statistically speaking, you’re more likely to die from a traffic accident (one in 71 deaths), flu (one in 1,642 deaths), or syphilis (one in 55,866 deaths) than Ebola (one in 2,515,458 deaths). Which brings me to my current favorite activist, anti-vaccine zealot and proponent of “well-researched” bad science, Modern Alternative Mama (MAM). Thus week, she’s been promoting what she optimistically calls a “risk:benefit analysis” of the DTaP (diphtheria, tetanus and pertussis) vaccine. Interestingly, she appears to consider all vaccine risks equal: death is no more of a minor inconvenience than redness at an injection site, and she earnestly notes that there is “no known benefit to getting diphtheria“. That sentence alone causes the mind to boggle. On a positive note, she does use valid CDC data, reporting that there were 3,169 adverse effects attributed to DTaP in 2011, which she claims is an underestimate of up to 9-fold. So let’s run the numbers. Each year, approximately 3.95 million babies are born, of which 82.5% are given the DTaP vaccine. Between birth and 6 years of age, 5 doses of DTaP are recommended, so each year, 5 x 3.95 million x 82.5% = 16,293,750 doses are given (note that babies will have three each in that year, but older children (18 months and 4-6 years) will also receive a dose). Let’s give MAM the benefit of the doubt and assume adverse vaccine events are actually 5x the cited CDC number, at 15,845 events. The CDC classifies 10% of these events as “serious”, which equals 1,585 serious events per year. So what is your child’s chance of having a serious reaction to the DTaP vaccine? 1,585/16,293,750 = 0.0000973, or one in 10,277 children will have a serious reaction to DTaP. By contrast, we could take our chances in not vaccinating and hope that our child doesn’t contract diphtheria, which carries a risk of death of up to 20% in children under five years old. That means one in five children who contract diphtheria will die. Given MAM’s antagonism towards vaccines, it’s not altogether surprising that she concludes “Although diphtheria is serious, it appears that the risk from the vaccine is much greater.” Yet let’s be realistic about this. One in 10,277 children will have a serious reaction to DTaP (serious reactions does not mean death, although that is one possible outcome) versus one in five children who will die after contracting diphtheria. Admittedly that’s assuming that all unvaccinated children will get diphtheria. They won’t, but even if only 5% do, the risk is still overwhelmingly lower in the vaccine category (one in 10,277 suffering a serious reaction to the vaccine vs. one in 100 dying from diphtheria). The site carries a disclaimer that writers are neither education professionals nor providing medical advice, yet the suggestion (by the author herself) that this is a well-researched, scientific post will no doubt cause some parents to congratulate themselves on their choice to not vaccinate. This pseudoscientific scaremongering is dangerous, potentially lethal. All parents are concerned for their children’s health and welfare, but propounding nonsensical “risk:benefit analyses” that do not consider the denominator but simply the total adverse effects does not allow any parent to make a rational and well-considered decision. If my child is the one in 10,277 who suffers a serious DTaP vaccine reaction, I’m unlikely to care whether she is one of few or many, but at least I can make the decision whether or not to vaccinate (my answer is an overwhelming “yes”) based on risk. We all want our babies to grow up healthy and happy – in this case, it’s time to be a mainstream vaccinating Mama, rather than a “modern alternative” one. Hyperbole, Hysteria, and a Sample Size of One – Where’s the Science? I often describe this blog as a place where I write about things that irritate me. Today, is a case in point. There’s a new princess of technology paranoia on the block: move over Jenny McCarthy, because Modern Alternative Mama (MAM) is out to smother your crown with homemade liver pills and tweak it off your head. Billed as “a community of supportive people and well-researched information” the site is full of useful hints and tips on how to keep your children healthy – which in this case means unvaccinated, with unbrushed teeth and breast milk squirted up their noses to cure congestion. I wish this were my hyperbole – it’s not. One of the common themes in the litany of anti-vaccination posts is the fact that vaccine scientists need funding to do experiments (gasp!) and that such funding comes from companies that manufacture vaccines (gasp!). Obviously these scientists are the epitome of corporate shilldom and would sell their first-born child for a microscope and box of latex gloves. Best not to trust their pesky peer-reviewed science. Don’t worry though, MAM is here to do the research for you and write about in a balanced and fair way. This translates roughly as: “Science (pesky corporate shills) shows there is no harmful effect of X, but if you allow the dastardly medical profession to force it on your defenseless bundle of joy they have a 756% increased risk of <insert scary disease here>, will be in therapy (blaming YOU) till they’re 45, and will never pass third-grade algebra. Oh, and did we mention that X has been linked to leukemia/childhood obesity/autism/type II diabetes/ADD/teenage pregnancy/atheism/voting Republican (delete as appropriate)“. They helpfully highlight the scary messages on the website in bold, so that you don’t miss them. As with so many anti-technology sites, science is the enemy…unless it’s happy touchy feely science that backs up whatever theory is being propounded this week. Which is why it’s so funny to see them reporting that Baltic amber necklaces “really work” for preventing teething issues in babies. One of the bloggers was sent a necklace by an amber company. She put it on her baby at 3 months of age (too early to teethe). 5 months and 5 teeth later – no loss of sleep, no cranky baby, no teething problems whatsoever. Hooray! It’s a miracle! In her words: “Baltic amber is a win!” For the moment, let’s gloss over the fact that the necklace was provided free of charge and that the blogger was compensated for her post (ahem, Baltic amber shill). So let me compare this to my experience. My baby is now 8.5 months old and also has 5 teeth. 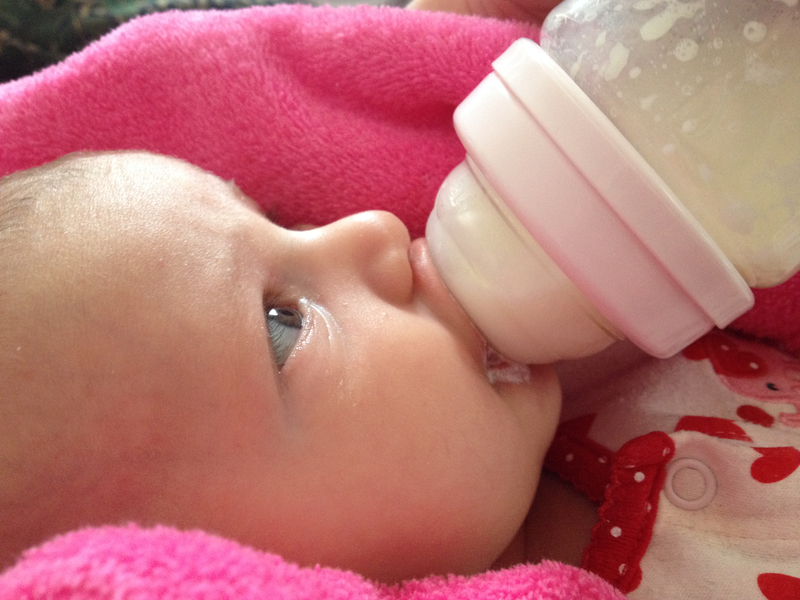 We’ve had no loss of sleep, no crankiness, no problems whatsoever with teething….and no amber necklace! Hooray! It’s a miracle! Wearing stripy Rainbow Brite-style leggings and pointing excitedly at next door’s dog (my daughter’s current favorite activity) are a win! Or maybe it’s the cucumber that she often eats for dinner! Or the fact that she can see the mountains from her crib! Or… some babies just teethe better than others. 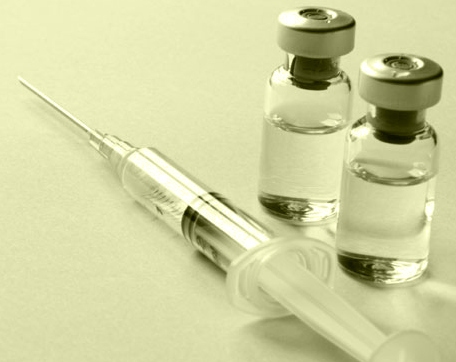 Billions of children have been given vaccines that prevent disease with no ill-effects whatsoever, which the anti-vaccination activists appear to consider irrelevant. Yet one child given an amber necklace, with no control group or latin-square experimental design to test it’s efficacy – it’s a win! Baltic amber works! For goodness sake, try and be consistent MAM – you wouldn’t consider a sample size of one (my daughter for example, who has experienced no adverse effects from vaccines to date) to be proof that vaccines are ok – why do it with other issues that affect children’s health and wellbeing? I’m not suggesting that teething pain is on the same scale of importance as the provision of vaccines, but let’s be realistic. If you’re going to this site (or others like it) for unbiased, sound information about vaccines or child health, just take a look at the other posts and products that are being promoted. Would I take cardiac advice from a surgeon who offered me three leeches and a tincture of wormwood to cure cancer*? No – and neither should you. My Twitter feed just exploded. Yet another study has been released claiming that if we all just gave up beef, the planet would be saved, Elvis would come back from the dead, and rainbow-belching unicorns would graze the Northern Great Plains. I may have exaggerated a little with the latter two claims, but the extent of media coverage related to the paper “Land, irrigation water, greenhouse gas and reactive nitrogen burdens of meat, eggs and dairy production in the United States” seems to suggest that the results within are as exciting as seeing Elvis riding one of those unicorns…but they’re also about as believable. Much as we’d all like to stick our fingers in our ears and sing “La la la la” whenever anybody mentions greenhouse gases or water footprints, we cannot deny that beef has an environmental impact. Yet, here’s the rub – so does every single thing we eat. From apples to zucchini; Twinkies to organically-grown, hand-harvested, polished-by-mountain-virgins, heirloom tomatoes. Some impacts are positive (providing habitat for wildlife and birds), some are negative (nutrient run-off into water courses), but all foods use natural resources (land, water, fossil fuels) and are associated with greenhouse gas emissions. So is this simply another attack on the beef industry from vegetarian authors out to promote an agenda? Possibly. The inclusion of multiple phrases suggesting that we should replace beef with other protein sources seems to indicate so. But regardless of whether it’s part of the big bad vegan agenda, or simply a paper from a scientist whose dietary choices happen to complement the topic of his scientific papers, the fact remains that it’s been published in a world-renowned journal and should therefore be seen as an example of good science. I’m the first to rely on scientific, peer-reviewed papers as being the holy grail for facts and figures, but there’s a distressing trend for authors to excuse poor scientific analysis by stating that high-quality data was not available. It’s simple. Just like a recipe – if you put junk in, you get junk out. So if one of the major data inputs to your analysis (in this case, feed efficiency data) is less than reliable, the accuracy of your conclusions is….? Yep. As useful as a chocolate teapot. Feed efficiency is the cut-and-paste, go-to argument for activist groups opposed to animal agriculture. Claims that beef uses 10, 20 or even 30 lbs of corn per lb of beef are commonly used (as in this paper) as justification for abolishing beef production. However, in this case, the argument falls flat, because, rather than using modern feed efficiency data, the authors employed USDA data, which has not been updated for 30 years. That’s rather like assuming a computer from the early 1980’s (I used to play “donkey” on such a black/green screened behemoth) is as efficient as a modern laptop, or that the original brick-sized “car phones” were equal to modern iPhones. If we look back at the environmental impact of the beef industry 30 years ago, we see that modern beef production uses 30% fewer animals, 19% less feed, 12% less water, 33% less land and has a 16% lower carbon footprint. Given the archaic data used, is it really surprising that this latest paper overestimates beef’s environmental impact? The authors also seem to assume that feed comes in a big sack labeled “Animal Feed” (from the Roadrunner cartoon ACME Feed Co?) and is fed interchangeably to pigs, poultry and cattle. As I’ve blogged about before, we can’t simply examine feed efficiency as a basis for whether we should choose the steak or the chicken breast for dinner, we also have to examine the potential competition between animal feed and human food. When we look at the proportion of ingredients in livestock diets that are human-edible (e.g. corn, soy) vs. inedible (e.g. grass, other forages, by-products), milk and beef are better choices than pork and poultry due to the heavy reliance of monogastric animals on concentrate feeds. By-product feeds are also completely excluded from the analysis, which makes me wonder precisely what the authors think happens to the millions of tons of cottonseed meal, citrus pulp, distillers grains, sunflower seed meal etc, produced in the USA each year. Finally, the authors claim that cattle use 28x more land than pigs or poultry – although they acknowledge that cattle are raised on pasture, it’s not included in the calculations, which assume that cattle are fed feedlot diets for the majority of their life. This is a gross error and underlines their complete ignorance of the U.S. beef industry. Without cow-calf operations, the U.S. beef industry simply would not exist – efficient use of rangeland upon which we cannot grow human food crops both provides the foundation for the beef industry and creates and maintains habitats for many rare and endangered species of plants, insects, birds and animals. Want to know how to reduce the environmental impact of food production overnight? 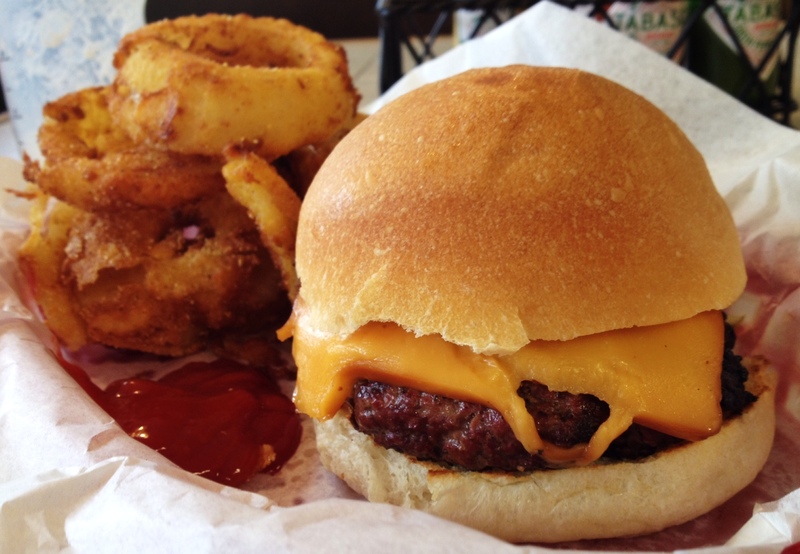 It’s very simple – and it doesn’t involve giving up beef. Globally we waste 30% of food – and in developed countries that’s almost always avoidable at the consumer level. Buy the right amount, don’t leave it in the fridge to go moldy, and learn to use odd bits of food in soups or stews. Our parents and grandparents did it out of necessity – we can do it to reduce resource use and greenhouse gas emissions; and take the wind out of the sails of bean-eating anti-beef activists. I’ve just been involved in that most pointless of activities – a Twitter argument. Entirely without value as neither side will admit defeat (or even concede ground) and it’s difficult to make rational, lucid points using words like “hereafter” and “whither” when the 140 character limit turns scientific discussion into a sea of “u r misinformed re: assoc w/glutfree diet” gobbledegook. This debate was caused by me posting the photo to the left relating to the use of “gluten-free” as a marketing term associated with supposedly healthier food. However, in the tweet below, the arguer (arguee?) demonstrated the commonly confused correlation vs. causation which appears to be the poster child for populist bandwagon-jumping science. 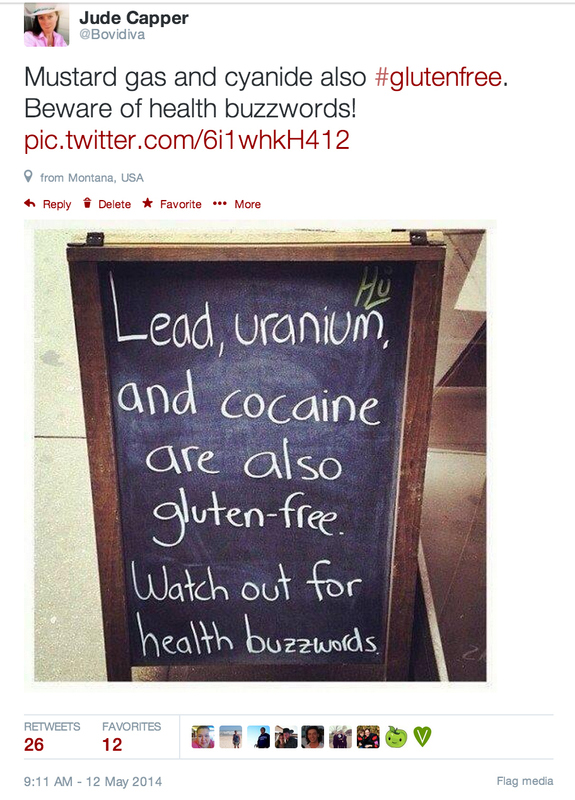 Their follow-up tweet cited this website, which claims that 55 diseases can be caused by eating gluten, and there’s a link to a peer-reviewed New England Journal of Medicine paper to prove it. Excellent use of scientific literature to support the adoption of a gluten-free diet. 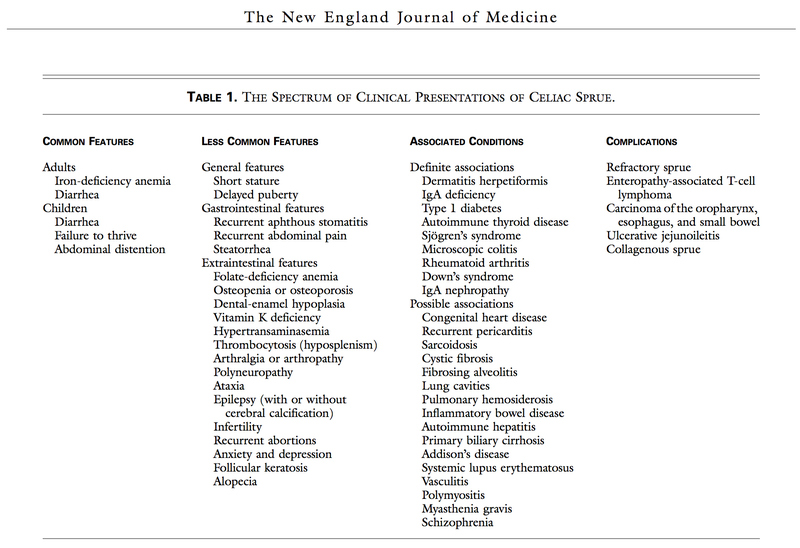 Just one tiny problem… the 55 diseases* listed in the table to the left are indeed associated with cœliac** disease in that people who are cœliac (0.3-0.8% of the population) often also suffer from a range of other conditions. However, this does not mean that anybody suffering from short stature, diarrhea, rheumatoid arthritis or congenital heart disease will have their symptoms relieved by adopting a gluten-free diet. Heck, if it did, we’d all be 6 feet tall and heart-healthy, right? To put it another way, all penguins are black and white. Does that mean that all black and white objects are penguins? I have utmost sympathy for sufferers of cœliac disease as it must be a very difficult and painful condition. However, when a gluten-free diet is not only promoted being more healthy for the general population, but backed by willful misinterpretation of peer-reviewed data, it’s just another indication that we need better scientific education. Correlation not causation – rinse and repeat.